Gaijin Entertainment have launched a WW2 event series, called WW2 Chronicles, for their steel-clad MMO War Thunder. War, what is it good for? Well, making up this list of the best WW2 games, for one thing. 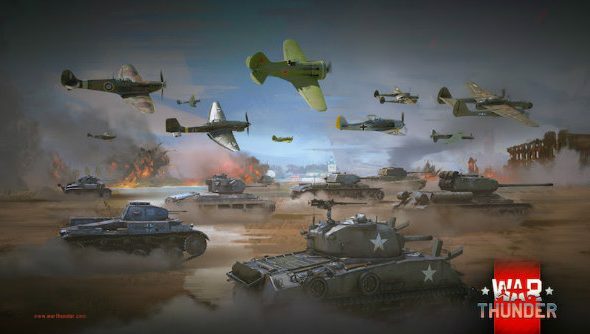 During the event, players can take part in a recreation of more than 70 WW2 battles which will be updated on a daily basis, at 13:00 GMT. Pilots and tank commanders will be able to win prizes by taking part in the event’s daily tasks. If you want to take part in WW2 Chronicles, you can do so up until May 9. This week will feature authentic WW2 campaigns based on the North Africa campaign, the battle for Stalingrad and the Siege of Malta. Completing daily challenges during this time could net you some rare vehicles, such as: A34 Comet “Iron Duke” IV, a KV-2 mod. 1940, an MBR-2, Richard Bong’s P-38J and various other prizes. Different prizes will be available for pilots and tank drivers right through until the end of WW2 Chronicles. For a full list of challenge requirements, head over to the official site. There’s also a post detailing all the planned events.